One of the many types of forestry mowers used on FMR projects, often a bobcat or skidsteer with a modified front attachment. You may think winter is the offseason for FMR’s outdoor work – a time when our ecologists are huddled inside for warmth, writing reports and grants, and pining for the first hints of spring. But restoration work doesn’t stop because of snow. In fact, some tasks are specifically timed for the cold season. For many of our restoration crews, winter means invasive species removal. 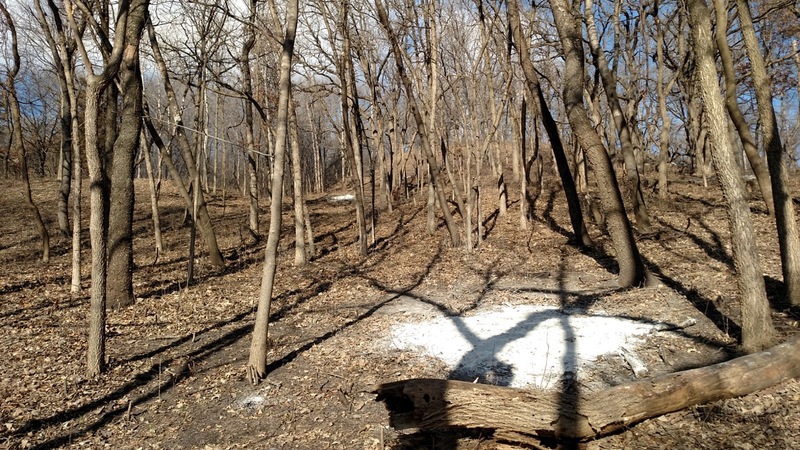 Since so many other ecological restoration tasks must take place during the growing season, contractors often reserve the winter for clearing out buckthorn, honeysuckle and other invasives. Frozen ground allows us to utilize heavy machinery like forestry mowers to remove buckthorn in dense stands or at sites with low ecological diversity, where we're less worried about damage. Snow cover also allows us to create burn piles without much worry about the fire escaping. Remnants of winter burn piles in a cleared woodland in Cottage Grove. FMR has roughly 400 acres of buckthorn removal slated for winter 2018. Crews will be busy at sites throughout the metro, ranging from smaller projects like an 11-acre removal at Camel’s Hump Park and Open Space in Cottage Grove to 110 acres of removal at Hampton Woods Wildlife Mangement Area. While most of these acres will be done by hand, with chainsaws and brush saws, some will be "forestry mowed" as well. While forestry mowing has its limitations it's proven to be very cost-effective and efficient. Before the ground freezes, this kind of heavy work can cause rutting and erosion and damage native plants that are still actively growing. And at sites with high native diversity in the shrub or sapling layers, forestry mowing isn’t selective enough to avoid harming these species. So at FMR, we only forestry mow in the winter, and only at degraded sites with low native species diversity. At a place like Hampton Woods, where there's exceptional native plant diversity and a relatively low cover of buckthorn in many places, crews stick to hand removal, and pile and burn cut brush. But forestry mowing costs less per acre, and the resulting mulch, as you can see below, is quite thick and can suppress the germination of buckthorn and other invasive plants. Forestry mowing mulches the standing material and grinds up the stumps, often allowing crews to pass through and treat any remaining stumps by hand (blue dye in lower right). A view of an area that was forestry mowed (right) versus one yet to have its buckthorn removed (left) at the William H. Houlton Conservation Area in Elk River. Whether by hand or by forestry mower, winter is an important time for removing invasive shrubs. It is often the first step towards restoring a prairie or forest and sets the stage for much of our work for the rest of the year, clearing the way for more "glamorous" tasks and volunteer outings like prairie seedings or woodland plantings.